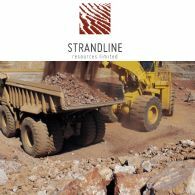 Strandline Resources Limited (ASX:STA) provides an update on Pre-Feasibility Studies being conducted into the mining and processing of its MG14 and Windabout copper-cobalt-silver resources ("the Mining Projects") in South Australia. 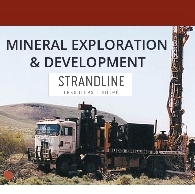 Strandline Resources Limited (ASX:STA) is pleased to advise that Western Areas Limited (ASX:WSA) has recently completed a detailed magnetic survey over Strandline&apos;s 100% owned, 700km2 Fowlers Bay Project. This survey represents the first stage of Western Areas&apos; earn in to Fowlers Bay, a key part of a major exploration push in the Western Gawler region of South Australia. Gunson Resources&apos; (ASX:GUN) Managing Director and the General Manager of the Coburn Zircon Project spent the latter half of September in China, visiting CTIEC and other potential investors and offtake customers for the Coburn Project. Gunson Resources Limited (ASX: GUN) announces that Diamond drilling has commenced at the Chianti Prospect, one of several highly prospective areas that lie within the 1,470 square km Mount Gunson Copper Project in South Australia. Gunson Resources Limited (ASX: GUN) - Coburn Zircon Project - Second MOU with CTIEC - Mr David Harley, MD; Gunson Resources Limited (ASX: GUN) present the following audio webcast regarding "Coburn Zircon Project - Second MOU with CTIEC". You may also download this audio webcast to your computer or portable audio player. 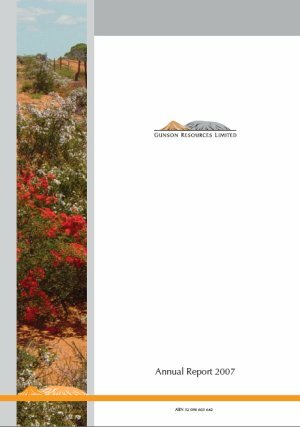 Gunson Resources Limited (ASX: GUN) - June 2007 Quarterly - Mr David Harley, MD; Gunson Resources Limited (ASX: GUN) present the following audio webcast regarding "June 2007 Quarterly". You may also download this audio webcast to your computer or portable audio player. 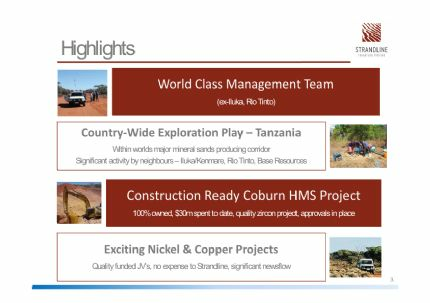 Gunson Resources Limited (ASX: GUN) - Presentation at 2007 AMEC National Mining Congress - Mr David Harley, MD; Boardroomradio is pleased to announce that Gunson Resources Limited (ASX: GUN) has published an audio file. Gunson Resources Limited (ASX: GUN) - Coburn Zircon Project Update - Mr David Harley, MD; Boardroomradio is pleased to announce that Gunson Resources Limited (ASX: GUN) has published an audio file. Gunson Resources Limited [B@781f2a; Boardroomradio is pleased to announce that Gunson Resources Limited (ASX: GUN) has published an audio file. Gunson Resources Limited (ASX: GUN) - Encouraging Drilling at Chianti - Mr David Harley, MD; Boardroomradio is pleased to announce that Gunson Resources Limited (ASX: GUN) has published an audio file. Gunson Resources Limited (ASX: GUN) - Drilling at the Mount Gunson Copper Project SA - Mr David Harley, MD; Boardroomradio is pleased to announce that Gunson Resources Limited (ASX: GUN) has published an audio file. Gunson Resources Limited (ASX: GUN) - Drilling Program at Mount Gunson - Mr David Harley, MD; Boardroomradio is pleased to announce that Gunson Resources Limited (ASX: GUN) has published an audio file.